The Apple iPad is one of the most anticipated mobile computing devices to have hit the scene in recent years, although it is not without its share of competitors. The most worthy opponent seems to be the Google Tablet, and already numerous comparisons have been made between the two innovative products. Here is yet another one, and it just may help you decide which one to choose. Like many of the company’s products, the Apple iPad offers a very attractive design, and the tablet concept is undoubtedly quite innovative. The iPad’s design stands in marked contrast to the bulky laptop paradigm, and users who have struggled with the unwieldy keyboard design are sure to take to it in droves. 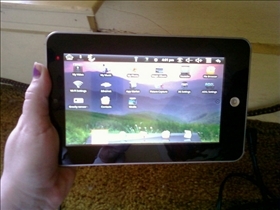 The iPad is also made a lot more convenient and easier to use thanks to its multi-touch UI. The Google Tablet is considerably handier than a laptop as well, although it is not nearly as sleek and portable as the iPad. Nevertheless, it offers enough of a departure from the traditional laptop design that new users should be eager to try it out. One of the biggest drawbacks of the Apple iPad is its inability to read Flash content. While many technophiles feel that Flash is on the way out, there is no denying that the iPad’s omission of this compatibility will hinder its flexibility somewhat. Many users of such products will no doubt be disappointed to find out that they simply will not be able to access flash based sites and sites with plenty of video content will just not be the same on the iPad. The Google Tablet will offer similar functionality to a laptop however, given its onboard Chrome OS. Of course this also means that the Google Tablet will be prone to variances in content reliability, although most users probably won't mind too much given all the functionality that the device offers. The fact that the iPad is basically a closed system is also a mixed blessing of sorts. Potential users will likely balk at the fact that the only way to get applications into the unit is by way of the company’s App Store, although this will of course ensure a much greater degree of reliability and compatibility. The Google Tablet on the other hand uses an open platform, which means a lot more flexibility that its users are sure to appreciate and take advantage of. As to whether or not this issue will cause you to favor one or the other is dependent on your particular needs and preferences. I was debating whether to buy iPad or wait for Google Tablet. Finally I ordered in Apple online store last week, my wait is 3 weeks. Me too.... But that won't stop me from getting the Google Tablet either. Maybe I'll give the iPad to my daughter... Oh wait, most of the sites she goes to are flash :( I'll find someone to take this. Google implemented YouTube in HTML5 a long time ago explicitly for iPad users. If you're going to make a blanketed generalization, you should at least make some attempt to "factcheck". Can only be loaded via Apple’s App Store. You can load PDFs, ePub books etc by loading them into iTunes and syncing. And like a previous poster wrote, YouTube runs in HTML5. There's even a YouTube app to view videos. Finally, most of the major sites (WSJ, NYT etc) have retooled their sites to be iPad-compatible, basically dumping Flash and using HTML5. ebooks and PDF's are not applications. you forgot manny things between google and Ipad.. Ipad can´t open more then 1 program at the time. that should not be a problem for google. Ipad does not have a webcam, I have heard that google´s has one. and manny other things. the only thing that Ipad is better as I think is how fast the Ipad is. but don´t know yet how fast google tablet is. I'll go for Apple IPad than Google Tablet. AMD vs. INTEL Chips: Which is better?